Action plan. Writing about health care. For today can I just write a blog about writing a blog? Of course I can. I’m the boss of me. Except that I started writing another piece today, one I realize could be considered controversial and should only see the light of day under deep pseudonym in the AARP magazine backpages–so I feel less the mistress of my own freedom than any thinly veiled braggadocio might suggest. That piece, the one you will likely not read, is about the atrocities of getting old in the changing workplaces of an ageist society where you are unappreciated as a still fierce force to be reckoned with. Instead the piece reads more like a Human Resource reportable incident than a blog post and do we really want to go there? If you do, message me discreetly. So anyway, in the spirit of positivity, let’s talk about a new project instead. This March I attended the annual conference “Writing, Publishing, and Social Media for Healthcare Professionals” at Harvard. I admit it was daunting to spend time with two hundred medical experts and hearing their pitches for what could easily become the next medical blockbuster. We met with agents, editors and publicists and attended three days of lectures on such topics as “How to Get Your Message Out in Today’s Changing Media Environment,” “Narrative Writing in Healing: The Power of Stories,” and “Publishing is Changing the Way Medicine is Practiced.” Participants left the conference all charged up with action plans and brand new twitter accounts. I left geared up to do…something. During the workshops I made a pretend pitch to write a patient-centered handbook, titled something like So How Was Your Week?, which would explain, in a conversational Anne Lamott-y tone, what to expect from your psychiatric encounter. I practiced and pitched it and got good marks for my delivery to a panel of a dozen agents and editors and the aforementioned two hundred others. No agents swarmed me for a book deal, nor did I really want one. My handbook just didn’t have the punch of, say, revolutionary non-pharmacological ways to beat the common headache forever or how one surgeon brings the dead back to life or the slam dunk memoir potential of impoverished illegal immigrant cures blindness (maybe I embellished a bit here) What I really want to do anyway is find ways of talking about how we feel about doing health care, how do our stories matter in the schema of Obama-care and litigation and insurance insanity? I’ll never be an Oliver Sacks or Atul Gawande, I’m just a worker on the front lines. But what if stories like mine and those of my colleagues could shine a light on the complexities of today’s health care and create better communication with patients, families, colleagues, legislators? What if we could promote health care by making our process more transparent? What if we found words to support each other during this process? Working on the front lines can be a lonely and misunderstood endeavor. Our stories have great potential to heal and I want to talk about ways to do this. So in the positive spirit of staying close to home and writing what you know, starting in May I’ll be working with the marketing and communication team at my local hospital to do some interviews and write some blogs and connect with my colleagues and patients to do the same. Stay tuned. In the meantime here are several collections with beautiful narrative, moving examples of the genre. Shades of Blue: Writers on Depression, Suicide, and Feeling Blue edited by Amy Ferris, Seal Press 2015. Mothering Through the Darkness: Women Open Up About the Postpartum Experience, edited by Jessica Smock and Stephanie Sprenger, She Writes Press 2015. Same Time next Week: True Stories of Working Through Mental Illness, edited by Lee Gutkind, InFact Books, 2015. Categories: Uncategorized | Tags: Amy Ferris, InFact Books, Lee Gutkind, mental-health, Seal Press, She Writes Press, Stephanie Sprenger Jessica Smock, Writing | Permalink. The nine-hour drive back from the Iota Conference of Short Prose last night became more wearisome with each mile. Metaphors abounded – a mile is like a sentence, each small town a paragraph, each visual transition a small piece of prose. With each random thought becoming a brilliant brief essay in its own right. You probably know what I mean, trips home from excitement – the hospital after having a baby, driving home after a good job interview, dinner with friends, a gallery excursion, a hike, a shopping expedition – your brain fills with ideas and plans for the next big (or little) thing. And then you are back, and slowly you fill with things of daily life, not so exciting. The things you forgot. The things you left undone. I always leave half my stuff in the car, looking like laziness on the surface, but actually another metaphor. 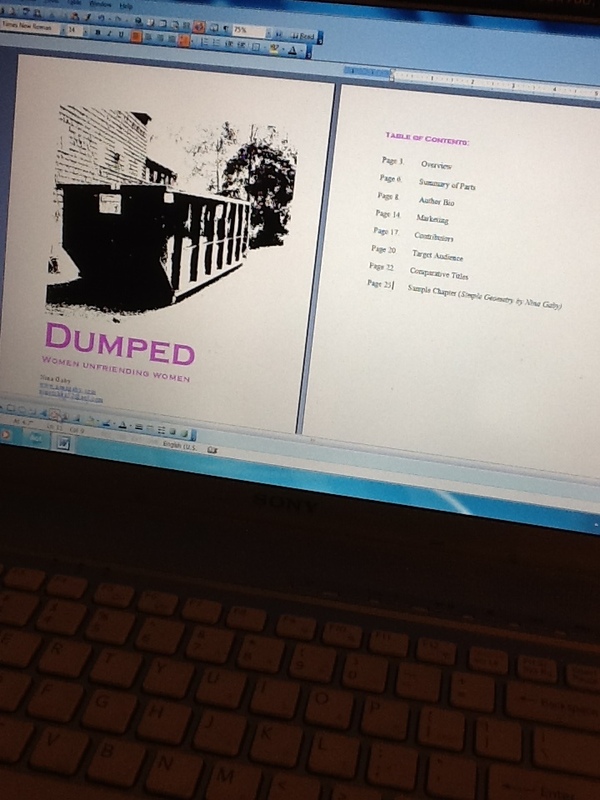 My manuscript for Dumped: Women Unfriending Women was left untouched and behind schedule. The days were filled with foggy views of the ubiquitous Atlantic Ocean, driving between New Brunswick’s Island of Campobello where the conference was being held, to Lubec, Maine, through the customs each time. Lubec, a movie set whose pastel and dilapidated buildings became paragraphs in themselves. 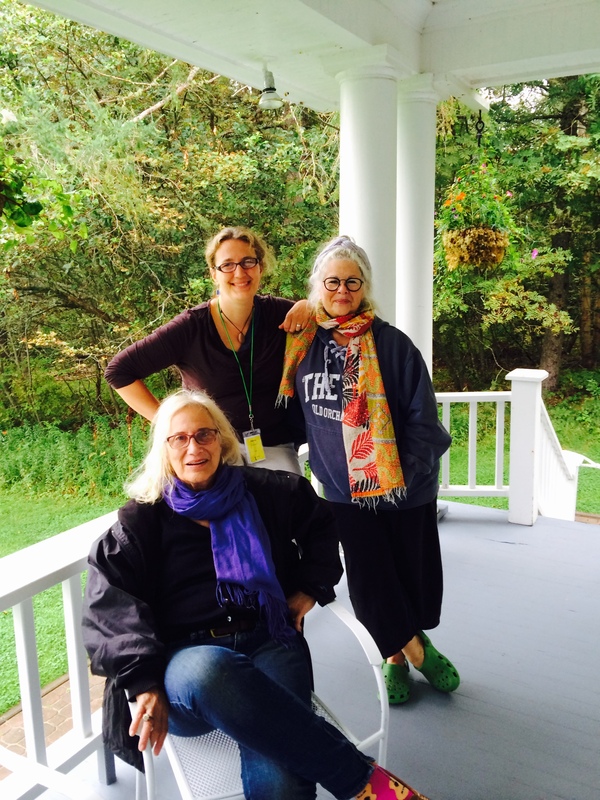 And the conference where two of my anthology contributors – Penny Guisinger, organizer of the conference, and Judith Podell, became actual three-dimensional entities. Not just paper and screen anymore but flesh and voice. Our faculty: Charles Coe whose poems about forgiving his parents escorted me back to childhood, Suzanne Strempek Shea whose tender enthusiasm made that child fantasize crawling into the backseat of her car and falling asleep, and then there was my faculty, Barbara Hurd, on whose mind I developed an unapologetic crush and threatened to make a photo of her into my screensaver. Like a stalker who wants to keep her with him always. It was funny in the moment. Now I wonder if I should delete that. Even the very private and elegant Hurd found it humorous after the first moment of terror…. but that’s what happens at these conferences. We are distilled into small working pods for that magical iota of time, wondering how we will go back home and write alone. The days were filled with reading and workshopping our small pieces – after all, that is what “iota” means: a very small amount, bit, speck, mite, scrap, shred, ounce, scintilla, atom, jot, grain, whit, trace. It all became much bigger than that. We wrote about the larger world in miniature, shifting the lens within a small frame from the personal and tiny meaning to the universal. Within the next breath. Paring word count. Stripping away excess. Might I be allowed to be corny and say that we lifted the fog on our words? Yes, it is my blog and I am still ever so slightly within the experience, and possibly well over word count. Categories: Uncategorized | Tags: anthology, Barbara Hurd, Charles Coe, Dumped, Dumped: Women Unfriending Women, Iota Conference of Short Prose, Judith Podell, She Writes Press, Suzanne Strempek Shea, Writing | Permalink. A PENANCE. A BLESSING. A DEADLINE. A guest blog on SHE WRITES PRESS. In anticipation of writing this blog post for BEHIND THE BOOK, I immediately sat down and wrote a whole craft essay instead. More of a memoir, actually. About waitressing. It really did apply, at least to much of this process. I wrote about being “in the weeds,” an old restaurant workers’ term for being too busy to think about anything except for the rush, about just needing for it to be over and going home with your greasy pockets bulging with tips. And “In the Weeds” will make a great craft essay one day. But this needs to be more about today and this process with a hybrid publisher, this very first rodeo on my own, and the complicated experiences that pushed me towards editing and publishing Dumped: Women Unfriending Women. As organisms, we tend to respond adversely to pain: it makes us wiggle around and eventually move in some different direction. The details of my own experiences with being dumped by friends over the years are the subject of my essay in the anthology. As I tried to make sense of this dynamic, I began to talk about it a lot, had begun to publish essays in a few anthologies myself, some articles and short stories (I had become a real writer), and everyone said, Wow what a great idea, do a book, yeah, call it “Dumped,” that’s so awesome. I was becoming impatient with where my life as a writer could go. I was about fifty-nine years old at the time, and on the precipice of old age. I had also written the first draft of a novel about the same experiences I was writing about in Dumped, but fictionalized (and funnier) and a collection of micro-prose. The writing had probably saved my life, as well as my opening a studio and doing some visual art, and having my career as a psychiatric nurse practitioner to fall back on when our life kind of went to pieces. A huge lesson in all of this becomes the contrast between who stands by you, who doesn’t, why, and what the lasting effects might be. In my case, I kept writing. And thinking about all the other women who had these stories to tell. The comedian Jonathan Winters once said “I couldn’t wait for success, so I went ahead without it.” I knew Brooke Warner from her days at Seal Press, where I had published a couple essays and had talked with her about another idea, a proposal I ultimately abandoned. I remembered her as skilled and enthusiastic. I hired her as a consultant/coach on Dumped. Through Brooke’s connection to another editor, I was introduced to an agent who was interested in my proposal. This was encouraging to me, a novice, and probably kept me going. But the agent needed famous writers as contributors to my collection if she was going to sell the idea. I was impatient. I had good writers–not famous, but really good. Then I got a couple of famous writers, but by this time, Brooke and I had the conversation about her press. At first I hadn’t understood how it worked (on some levels I’m still trying to figure it out), but it seemed like I was climbing up on the wave of publishing’s future. As I wrote on my blog site: “Did I dream of the traditional route? Getting on the train to Manhattan to lunch with my agent and strike a big advance with a major publishing house? That image also has me in white gloves, nylons, and a tight-waisted suit, much like the one my mother would have worn when she accompanied my father to do just that when I was a little girl. And if I focus on that, I might just end up too old to even get on the train without serious help.” I signed on with She Writes. In addition to renegotiating how we view publishing, I then had to renegotiate the “power” differential. I was now an editor. I posted a call for submissions to Dumped in Poets and Writers; I went to a conference on creative non-fiction in Oxford, MS and met several women who are contributing and one who has offered to write my foreword. A dear friend gave me a list of writers from her MFA program. I stalked a famous writer on a new book tour for permission to reprint one of my favorite essays of all time. I tried stalking a couple writers at AWP but the weather had grounded them elsewhere. I was disheartened by well-known women who would never get back to me. I was heartened by people who helped out in so many different ways. I got together with women who I thought had dumped me only to share our opposing perspectives. I stayed far away from others. And then I had to really be an editor and reject work. Yeah, I had to reject work. Me, the oft-times-rejected, had to reject. Me, dedicated to giving new writers their first chance. I’m a pro at my day job, setting boundaries all the time. But this is different and maybe the hardest part. The hardest part except for time. We do not, but we should, anticipate the power outages, the cataract surgeries, the computer problems, the sudden injury leaving our back too twisted to sit at the computer. Problems at the day job that might require shopping for a new interview outfit. The death of a friend, then another, leaving us too breathless to focus. Enough time goes by and we will have to re-experience the holidays, throw in some Seasonal Affective Disorder, another ice storm. Terror. Lots of things get in the way. But to be so busy with something? A penance. A blessing. And now a deadline. My focus today? I envision a beautiful book in a pile at AWP next March on the She Writes Press vendor table. Next March, the other side of the weeds. Categories: Uncategorized | Tags: anthology, Brooke Warner, Eleanor Henderson, essay, Nina Gaby, She Writes Press, SWP, Writing | Permalink. I woke early this morning to review some drafts. Submissions for my collection DUMPED: WOMEN UNFRIENDING WOMEN. As I go deeper into the process of putting together a book that only has one of my pieces in it, (an essay I wrote almost a year ago at a self-imposed and glorious retreat at Kripalu in the Berkshires, sitting, professionally edited, already six months,) I realize I have become an editor and business woman, maybe less a writer? Outside of reworking two lengthy essays and a blog piece for Brevity, what have I really done? Yesterday, after a 38-hour-in-3-day stint of working my day job so I could justify a whole day off to write uninterrupted, I didn’t write. I did many other things instead. Things that involved typing but not writing. I had a volley of e-mails with my accountant about setting up an LLC before signing my publishing contract. (The LLC being somewhat like the malpractice insurance I keep for my day job.) That then required several attempts at downloading forms from the Secretary of State and then calling several times to ask questions about those forms. Then more e-mails with the accountant about those forms. And the frustration of trying to deal with a rural bank. They have set up two previous business accounts for me, but they have changed hands and I can’t remember what I had to do to set up accounts before and the only person who does it now works only a couple hours a day and the person at the customer care center in the next state over suggested I drive to an address that is actually only a drive-through window so I got huffy with her which prompted a whole Facebook rant. And then after several more phone calls I realized I was in the wrong (I need the state paperwork before I can get a new checking account which they might have told me last week when I actually went into the bank for advice) which then prompted a delete of the whole thread on Facebook and then I felt crazy and watched Judge Judy from the treadmill. After business hours I continued to dutifully read a memoir strung together by women’s’ friendships, wondering if Susanna Sonnenberg would write a blurb for me. Hell, maybe she’ll write a piece. But overall, even reading good stuff feels like homework. Why am I bothering you with these increasingly run-on sentences? Because it wasn’t until this morning, so early that first light hadn’t even made up its mind, that I was able to quietly savor the actual pieces that writers are sending me. I laughed at Judith Podell’s essay notes. I marveled at Jessica Handler’s interplay of grief and attachment. I reviewed e-mails from famous and not so famous strangers and a promise from Carrie Kabak. Another from River Jordan. “Gems,” I thought to myself. “I’m stringing together gems.” Every downloaded form and unmet deadline, every psychiatric note and evaluation I do at my day job, they all serve as the jump rings which will glue together the final project. Like a charm bracelet. 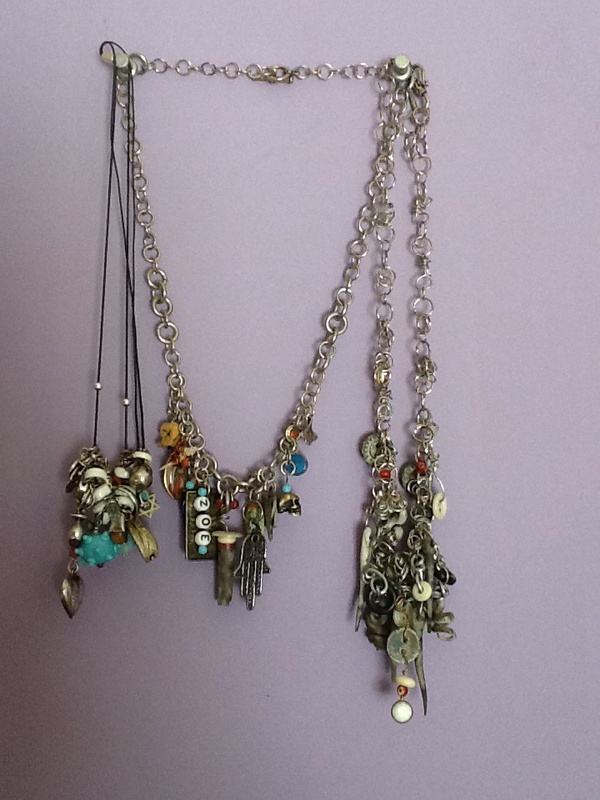 Like the amulets that my best friend in high school began stringing together for me, and now forty-five years later, a necklace I am still adding to. The magic imbued in each hamsah, scarab, evil eye, baby tooth. Making one for my daughter when she turned 16, one for a friend after her partner died. Graduation presents, tickets to safe places. Pieces of meaning and beauty and superstition. I do enjoy the metaphor for a moment before I pull the paperwork from my tote and start typing my documents for work, getting a start on the real day. Categories: Uncategorized | Tags: Carrie Kabak, Dumped: Women Unfriending Women, Jessica Handler, River Jordan, Writing | Permalink.